Home/Science of Sound/Sound Measurement/How is sound measured? Just as microphones are used to listen to sound in air, devices called hydrophones are used to listen to sound underwater. Microphones convert sound in air into electrical signals. The electrical signals can then be amplified, recorded, played back over loudspeakers, and transmitted over telephone lines. The electrical signals can also be used to measure the characteristics of the sound, such as amplitude and frequency. Similarly, hydrophones convert sound in water into electrical signals that can be amplified, recorded, played back over loudspeakers, and used to measure the characteristics of the sound. Hydrophones listen to sound, but do not transmit any sound. 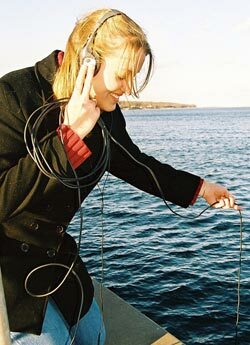 A hydrophone is used to listen to underwater sounds. Copyright University of Rhode Island. People were listening to underwater sounds with air tubes as early as 1490, when Leonardo da Vinci wrote about it. It wasn’t until the mid to late 1800’s that the technology was developed to convert acoustic signals into electrical signals, however. This technology advanced enough that by World War II, British, French, and American scientists were using echo-ranging to locate icebergs and submarines. The ability to locate submarines was invaluable against the German U-Boats. Most hydrophones are made from a piezoelectric material. This material has a special property that allows it to produce small electrical signals when squeezed, that is, when it is exposed to pressure changes. Because sound is a pressure wave, it can be detected by a piezoelectric element. Under the pressure of a sound wave, the piezoelectric element flexes and gives off electrical signals. These electrical signals can be recorded and later analyzed with computer programs to determine the properties of the sound wave, including amplitude and frequency. Some hydrophones, called omnidirectional hydrophones, record sounds from all directions with equal sensitivity. Other hydrophones, called directional hydrophones, have a higher sensitivity to signals from a particular direction. Directional receivers are most often constructed using a number of omnidirectional hydrophones combined in what is called an array. Directional hydrophones are typically used in systems for locating and tracking objects. A hydrophone array can be towed behind a ship or placed on the seafloor. In this image, sound is transmitted by the ship and reflected off the submerged submarine. The reflected sound reaches hydrophone A first, then hydrophone B, and finally hydrophone C. The time-of-arrival-difference between the hydrophones in the array is used to determine the direction to the submarine. Copyright University of Rhode Island. Hydrophones are specially designed for underwater use. They are normally encased in a rubber boot to provide protection from seawater. Hydrophones can be mounted in several different ways. They can be attached to a boat, towed, or placed in a fixed position underwater. It is actually fairly simple to build a basic hydrophone. Please visit the DOSITS Resources section to learn how to build a hydrophone. NOAA Ocean Explorer – Technologies for Ocean Acoustic Monitoring.